1) AUG 26 - SEPT 04 / SEVEN or more nights just $999 Per night / Add nights at just $499 per night! 20. Master bedroom #3 / “Kaanapali Vista” Is a bright bedroom with an amazing private lanai that truly captures the essence of the Kaanapali Vista name with it's views through Kaanapali Resort out to the Pacific Ocean, and on to Molokai and Lanai. 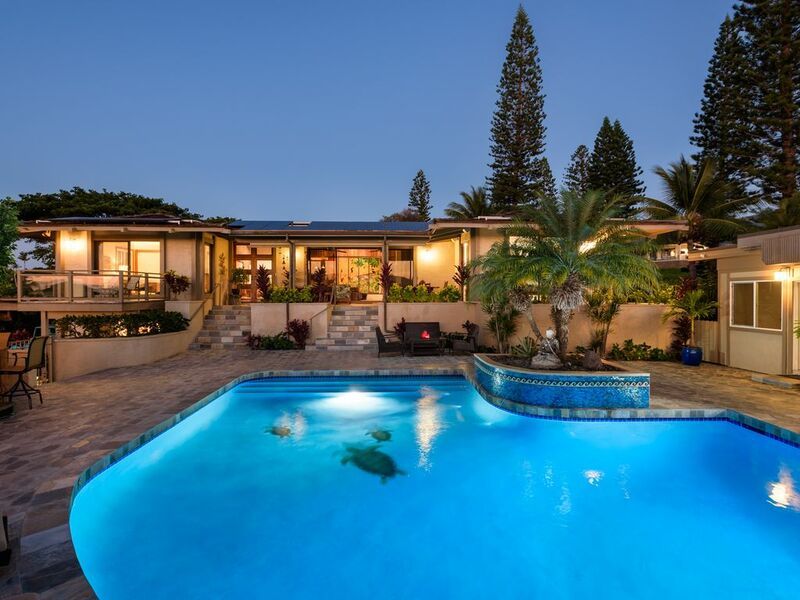 The Summit Residence is owned by Hawaii Real Estate Broker Steven G Gatchell R(B), who owns and operates Maui life Realty with his business partner Barry Ware R(S). Steven and Barry manage seven properties at the Honua Kai Resort and Spa on Kaanapali Beach North. If you have been shopping multiple properties, chances are you have come across Steven and Barry's names, and may know them as “Honua Kai's Finest”. Knowing “who” you are dealing with is crucial to the success of your precious vacation time. Steven and Barry have specialized in Luxury Vacation Rentals for over eight years on VRBO, and both have homes within minutes to the Summit residence. We are happy to share our other VRBO listings with you so that you have the utmost comfort in booking this exceptional Kaanapali Luxury home Rental. VRBO will ensure you are booking with a reputable company, Steven and Barry will ensure the highest level of customer care to ensure your expectations are met or exceeded. We have stayed in 90-100 vacation rental homes over the past 20 years. Summit is, by far, the very best. And not just because of the location and awesome features; all of which it has. Where it goes beyond is the personal touches and the details. There were board games, there was beach equipment. There were more than enough toilet paper rolls, paper towels, dishwashing detergent, spices in the cabinets, laundry detergent, jumbo sized bottles of shampoo/conditioner/body wash (I cannot tell you how many times I have had to go out to the store for these basics *multiple times* in the past at other rentals, which is super annoying.) Plus: comfy beds, high end pool furniture, even makeup wipes in the bathroom. He has literally thought of everything!! Order your groceries ahead of time & you’re good to go. Basically just show up with your swimsuit. There was plenty of space for our family of 10 plus 2 babysitters. None of us ever felt remotely cramped or on top of each other. There were 2 fridges and an ice maker (hello! We have one at home too and have never seen one before in a rental...and just think of how much ice a family of 10 uses in Maui!) We were just spoiled rotten!! And: There was a problem with the AC when we arrived, which is no one’s fault- and if you’re familiar with how things work on the islands, you can’t get things fixed overnight, but here’s where our experience went from wonderful to amazing: the caretaker showed up immediately before we even arrived with ample fans for all over the house; and then the owner of the house showed up and PERSONALLY fixed the air conditioning for us the next day...simply because our comfort was important to him, we didn’t have to wait days on end. He also gave us a price break for the inconvenience. AND came over to blow up inflatable pool toys for our kids. Who does all that?!? Seriously, we have never ever had this kind of experience with a rental property before. Steven is a customer service expert, as far as we’re concerned. The personal touch makes ALL the difference!!! We felt so cared for. The entire vibe of the place is to just enjoy yourself and relax...abundantly and continuously. The meditation area off the master bathroom is nothing less than stunningly beautiful and serene. I actually feel as if referring to Steven’s place as a “rental” does it a disservice- it feels as if you’re staying in your good friend’s home. We will be back for sure, no question. Mahalo Steven!!! Loved our stay at this house. The location was perfect… Easy access to the beach, shops, restaurants. The house was fantastic. The owners were very helpful and accommodating. We would definitely stay here again! Our group of 7 family members and friends stayed at this lovely home for 9 days in February. It was absolutely perfect for us. The house is beautifully appointed yet maintains a laid-back vibe. There are so many thoughtful touches, from buttery soft linens to beach chairs and boogie boards, to a commercial-grade ice machine. Great art - we loved all the statues scattered about the house and property. There is TONS of closet space and nice comfy beds. The double showers in the master and downstairs off the billiard room were awesome. All the bedrooms felt very private. Although the house is a quick (10 minute) walk to the Kaanapali beach and hotel strip, we actually found it hard to tear ourselves away from our fabulous pool and lanai. We spent long hours floating, mixing up cocktails, and listening to music on the great sound system. We cooked almost every night in the spacious kitchen, which provided just about everything we needed, and almost always ended the night playing pool in the billiard room. We even shocked ourselves by taking advantage of the workout room by the pool, which actually has really decent equipment. When a major snow storm at home threatened to cancel our departing flights, Steven offered us a generous discount on an extra night, which we took him up on. Such a nice guy! We felt very well taken care of while there, and have all agreed we will find a way to come back next year (hopefully for longer next time). In the meantime, I recommend this place 100 percent. Don't hesitate. It's very special. Thank you for the awesome review ! With all the comforts of home and the fun features to play with you never need to leave. Being so close to the action but private enough to never be bothered is a paradise in its own. We had a great time! The house was perfect! The house was everything we hoped for and more. The owner and property manager were extremely easy to work with and attentive to our concerns. This property worked well for our group of eight adults celebrating a 50th birthday! Great spot loved the location and the house layout. Great experience with the house and all of the amenities. Wonderful support from property management team and owner. Everything was perfect and everyone in our group of 7 thoroughly enjoyed our one week stay. The Summit Residence has something to offer for everyone. With all the features of home resting above Kaanapali you find yourself never wanting to leave. This house is absolutely amazing. We enjoyed everything about it....the pool, hot tub, the amazing stone tub (heavenly), the work out room, the well stocked kitchen , pool table we loved it all! It is an excellent location to the beach and shopping; the views from this house were just beautiful. Steve, Barry and Thomas were excellent in providing help before, during, and after the trip. Incredible customer service!! We are already planning our next visit!! Highly recommend it!! Thank you for everything! !